We mentioned a few weeks ago that Babaroga’s survival horror-themed board game, Zombies!!! (review) would soon be receiving its first PDLC expansion pack, known as ‘Zombies!!! 3.5: Not Dead Yet!’ As it turns out, the expansion has quietly slipped onto the Marketplace and won’t require a new title update. Finding it might prove a challenge though – you have to actually start a New Game and then select Expansion Packs from the top of the screen. While ‘Not Dead Yet!’ may not be easy to find, its price is fairly easy to swallow: 160 MS Points ($2), a bit lower than anticipated. Head past the break for WPCentral’s exclusive detailed descriptions of the expansion’s contents, hands-on impressions, and Achievement tips. Once you’ve purchased the ‘Not Dead Yet!’ expansion, you can enable or disable it by tapping the box next to the expansion name prior to starting a new game. The new cards will be mixed in with the original cards. ‘Not Dead Yet!’ cards sport a Z!! !3.5 in their lower-left corner, while original cards just have a Z!!! there. Did You Hear That? : Move all Zombies on your current tile to any legal space on an adjacent tile. Any Zombies that can’t be placed legally are returned to the Zombie pool. Hey, I Got One of Those: Play this card to gain a copy of any item or weapon card in play. I Could Use a Drink: Discard this card and the rest of the cards in your hand, if any. Immediately draw back up to three cards. I Know What You Did: Play this card if every other player has more Zombies than you to move yourself from your current tile to any legal space on an adjacent tile. Machete: Play this card in front of you when you are in the Outfitter, Barracks of Lawn and Garden Center. As long as you have this card in play add +1 to all combat rolls. Machete counts as a weapon. Meat Cleaver: Play this card in front of you when you are in any building or store. You gain +1 to all your combat rolls until you lose a life token in combat. Meat cleaver counts as a weapon. My, You Look Familiar: Play this card to look at the top three cards of any event deck. After looking, discard one, place one on the bottom of the deck, and replace one on top of the deck from which it came. No Guts, No Glory: Until the end of your next turn, no player may spend any bullets in Zombie combat. Oooooh, What Luck! 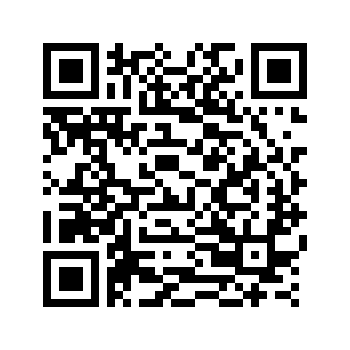 : Play this card when you are in any building or store. You may immediately play any weapon from your hand and place it in front of you as if you just found it. The weapon may then be used as normal. Power Outage: Play this card anytime. No one may pick up any tokens until the end of your next turn. Sheer Determination: Discard1 bullet and 1 life token to take any card from your discard pile into your hand. You may not violate normal hand size by using this card. That’s Not So Scary: Play only during your turn. If you have exactly 1 life and 1 bullet tokens, take another turn. There You Are! : Place your pawn on the same square as the nearest opponent’s pawn. 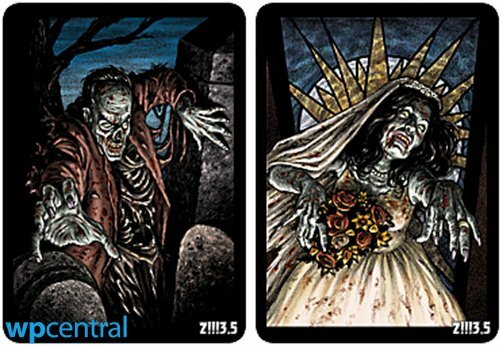 They’re Coming For You,__________: Place a Zombie on every legal square on an opponent’s tile. Too…Tired...to…Run: After this card is played no movement rolls are made until the end of your next turn. Players may still move due to card effects. Troubled Childhood: Look at the cards in one opponent’s hand. Where did he go? : You may discard this card at any time to place a Zombie anywhere on the board. This counts as a weapon/item. 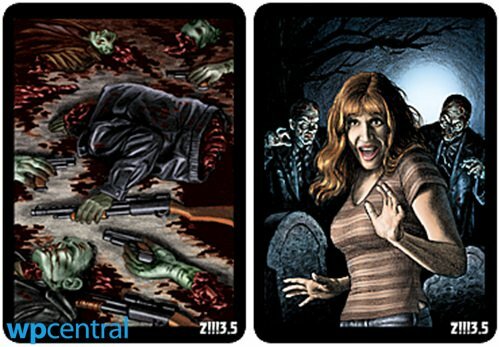 All of these cards feature the original, unedited art from Dave Aikins. The most significant additions in this expansion are the two new weapons, the machete and the meat cleaver. Both have new animations and sound effects when used in combat. Once played, the machete basically stays with you for the rest of the game (unless another players makes you drop it), adding +1 to combat rolls. It’s definitely handy to have when the undead come a-calling. The meat cleaver is more fragile than the Machete, as you’ll lose it if you take damage during combat. You can hold onto it longer by using bullets or activating another in-play card that raises your roll high enough to prevent damage. The meat cleaver also has its own Achievement (Fresh Meat) for killing 50 enemies with its blade. The best way to earn Fresh Meat is by playing Survival Mode – I got 27 cleaver kills in one game, so two games should do it if you play carefully. Original : The Keys Are Still In It! ; Hey Look… A Shotgun! Then just discard anything that won’t contribute to the Achievements. Play smart and watch for opportunities to unlock each Achievement. ‘Zombies 3.5: Not Dead Yet!’ is well worth the cost for Zombies!!! fans. The Achievements alone will add at two or three hours of playtime. Even when you’re not hunting for GamerScore, 3.5’s new cards simply add more life to an enjoyable virtual board game. Babaroga will also be bringing more of the real-life board game’s expansion packs to the game in the future. A poll on the company’s Facebook page allows gamers to vote on which expansion they’d like to see next. Online multiplayer is also planned for the next title update, which should arrive later this year. To learn more, see our developer interview. Zombies!!! game costs $4.99 and there is a free trial. Pick it up here on the Marketplace.